Are You Creating Your Perfect Reality? Part 3- Limiting the Influence of Your Limiting Beliefs. In the quest to uncover your limiting beliefs I asked you to listen to your inner critic and to pay attention to your inner dialogue. Identifying a limiting belief requires paying close and honest attention to your reactions in certain situations. Unless you really don’t like pools, do you hear the negative push back? Let’s say another good friend buys a Porsche. How would that make you feel? You’ll probably say “Great” ‘That’s fantastic!” “Can I take it for a drive?” and mean it because you are happy for your friend but what are you really saying to yourself on a deeper level? You probably had the thoughts that you can’t afford these things because you don’t make enough money. You may rationalize that you don’t make enough money because you’re not as educated or talented as your friend. Or that Jim is just that kind of guy, he always seems to get what he wants. These examples of push back all translate to the underlying limiting belief that you aren't good enough. So whatever the examples are that you come up with, the actual reason is the underlying belief - “I’m not good enough”. The reasons are the symptoms. So that is the tricky part. Identifying and accepting these truths about ourselves. You have to own it, and this is the hardest part because actually saying that you have this belief and acknowledging the truth of it to yourself can be difficult. You have to be completely honest with yourself. This is when you are tested. Can you accept that you have this belief or do you find yourself being pulled back into the belief and then heap on more evidence to prove why it is true. In my article The Best Way To Change a Habit I talk about how we actually change our beliefs to match our reality. For example, telling ourselves that eating the grapes in the fruit section of the supermarket is O.K. because we need to test their freshness. We make it O.K. for us to do something we know is wrong by changing our belief about it. 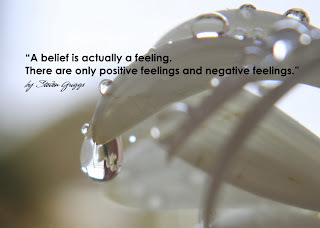 A belief is actually a feeling. There are only positive feelings and negative feelings. When you are truly aligned with your positive feelings and take inspired action, you can create the results you seek. Conversely you can have a positive feeling about something and take action but the underlying negative feeling or limiting belief counters the positive and you end up going nowhere. You keep getting the same unsatisfactory results. That’s why so many people have a problem with the Law of Attraction. They are only getting part of the story. Unless you are clear and able to release limiting beliefs you are just spinning your wheels. Vision boards and positive thinking are just exercises in futility. You can’t over power a limiting belief by trying to cover it over with positive thoughts and envisioning yourself having what you want. They are simply too imbedded and powerful. But by identifying your negative programming and getting clear on how you got the limiting belief in the first place, you can begin the process of reducing and eliminating the belief. In a previous article on Limiting Beliefs I recommend three techniques that work to release limiting beliefs. Please know that this is a continual process. You can’t just magically snap your fingers and make all your limiting beliefs disappear. They need to be worked on all the time. Some beliefs may dissipate but then show up later in a slightly different form. A really good method is through meditation. There are some really interesting healing meditations. You actually have a conversation with your childhood self and help him or her to understand the situation that occurred to give you a certain limiting belief. I will be posting some meditations in future articles. Another method is through the four questions from “The Work” by Byron Katie. How do you react, what happens when you have that thought? Visit her website www.byronkatie.com to learn more. A third method is called Emotional Freedom Techniques (EFT) or Tapping. This technique addresses your limiting beliefs by tapping on certain parts of your face and hands. These tapping points are the Ch'i or energy channels that run through our bodies.Visit their website: www.tapping.com. Really, once you dig in and get to the bottom of your issues you will discover they mostly revolve around self-worth or self-esteem. But as you get clearer and consciously work on these issues, you will become lighter and more in tune with your true self. Then things will start moving faster, things will happen faster and you will be off and running.